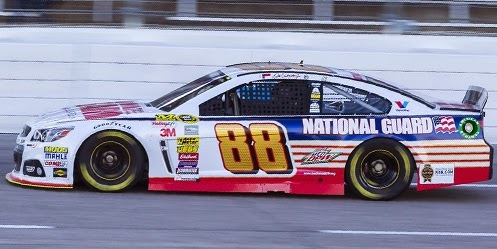 Dale Earnhardt, Jr. picked up the 7th last-place finish of his NASCAR Sprint Cup Series career in Monday’s Duck Commander 500 at the Texas Motor Speedway when his #88 National Guard Chevrolet was involved in a scary single-car accident after he completed 12 of the race’s 340 laps. The finish was Earnhardt, Jr.’s first of the 2014 season and his first while driving for Hendrick Motorsports. It is also his first last-place finish in 225 Cup Series races, dating back to November 11, 2007 and the Checker Auto Parts 500 at Phoenix. That day, in his next-to-last race in DEI’s #8 Budweiser Chevrolet, Earnhardt, Jr. was taken out in another single-car crash after he completed 118 laps. He has never finished last in 130 NASCAR Nationwide Series races. After seven Cup Series races, we now have seven different race winners, seven different pole winners, and seven different last-place finishers. Earnhardt, Jr. came into the race as the point leader and one of the favorites to win at the site of his maiden Cup victory in 2000. The popular third-generation driver won the season-opening Daytona 500 and finished outside the Top 12 just once - a 24th at Bristol. Last week at Martinsville, he led 25 laps and was within sight of the leaders when he checkered flag fell. At Texas, Earnhardt, Jr. was 4th in the opening practice, 25th in the second, and timed in 19th at an average speed of 193.354 mph. He also made a rare start in Friday’s Nationwide Series event, starting 4th and finishing 5th. Rain then delayed the Cup race from Sunday afternoon to Monday at noon. In order to finish drying the track, the opening ten laps of Monday’s race were run under the caution flag. During those laps, 43rd ended up changing hands a few times as several drivers, most notably Brad Keselowski, were forced to make unscheduled stops for hoods and flaps damaged by the speedway’s track dryers. NASCAR gave those drivers their spots back prior to the Lap 11 green flag, so 43rd-place starter David Ragan retained the spot. Landon Cassill and his Hillman Racing #40 Chevrolet had just fallen to 43rd when the caution came out once more on Lap 14. Dale Earnhardt, Jr. was following Aric Almirola through the quad-oval when he cut the exit too close, causing his left-front to cross the grass. Instantly, the sopping-wet turf gripped his splitter, ripping it under his car and sending him hard into the Turn 1 wall. His car on fire, Earnhardt, Jr. managed to stop it safely on the apron, and he climbed out quickly and unharmed. Although the #88 crew tried to fix their battered Chevrolet, they soon packed up, ending their day. This was a saving grace for Kevin Harvick, who just after losing the lead blew an engine on Lap 28, ending his day. Earnhardt, Jr.’s crash was all that kept Harvick from his first last-place finish in 473 Cup starts, leaving him instead with his third career 42nd-place run. The remainder of the Bottom Five completed almost the entire distance, continuing a trend that started at Las Vegas. In 41st was Dave Blaney, who after four DNQs and two withdrawals, finally gave team owner Randy Humphrey his first start of the year. He was running nine laps down when steering problems ended his day. In 40th was Parker Kligerman, whose difficult rookie season continued with late overheating issues. And rounding out the Bottom Five was Kurt Busch, who brought out three of the last four cautions, including a spectacular left-rear tire failure that forced a green-white-checkered finish when eventual race winner Joey Logano was just a few hundred feet from the finish line. *Earnhardt, Jr. is the first driver to win the Daytona 500 and finish last in a Cup race since 2009, when Matt Kenseth won the 500 and the following race at Fontana before his #17 USG Sheetrock Ford finished last in the season’s third round at Las Vegas. *This is the first last-place finish for Hendrick Motorsports in a Cup Series race since April 26, 2009, when Mark Martin’s #5 Carquest / Kellogg’s Chevrolet crashed out after seven laps of the Aaron’s 499 at Talladega. *This is the first last-place finish for the #88 in a Cup Series race since May 28, 2006 when Dale Jarrett’s UPS Ford crashed on the opening lap of the Coca-Cola 600 at Charlotte. Prior to that, the number hadn’t finished last in Cup since the same event sixteen years earlier (Larry Pearson). The number had never before finished last in a Cup race at Texas. Because I'm a sucker for random stats, do you happen to know the last time a Cup driver came into a race with the championship lead and finished last in that race? I don't think it's happened for quite a while. The last one I can remember is 2003 Homestead with Kenseth after he had already locked up the championship. He said it right in the article. Matt Kenseth in 2009. Won Daytona and Fontana and finished last in Las Vegas.